It’s common for Christians to assume that Christian churches resisted Adolf Hitler in Nazi Germany. The truth is that not only did few even go so far as to voice criticism, much less overtly and publicly resist, but some actually made serious arguments for the idea that Christianity and Nazi ideology were totally compatible. Such arguments for compatibility could either focus on the ideologies’ specific teachings, on their general approaches to life and society, or both. A focus on the “essence” of Christianity and National Socialism was probably more common, and Christians who did this also tended to discover that both were inherently more compatible with the German character. The idea that there was something essentially “German” about “true” Christianity might seem bizarre today, but it’s not that different from Christians in America acting like Christianity is especially compatible with American politics, American market capitalism, the American character. Just how often do we see Americans behaving as though they believe their god singles out America for special blessings and favors? Protestants in Nazi Germany, not unlike their counterparts in modern America, tried to fuse Christianity with their contemporary politics much more than Catholics, but Nazi Catholics were able to rely on the fact that their own church is so authoritarian. If authoritarian control is acceptable within the church, it’s hard to argue that it’s unacceptable for the government. 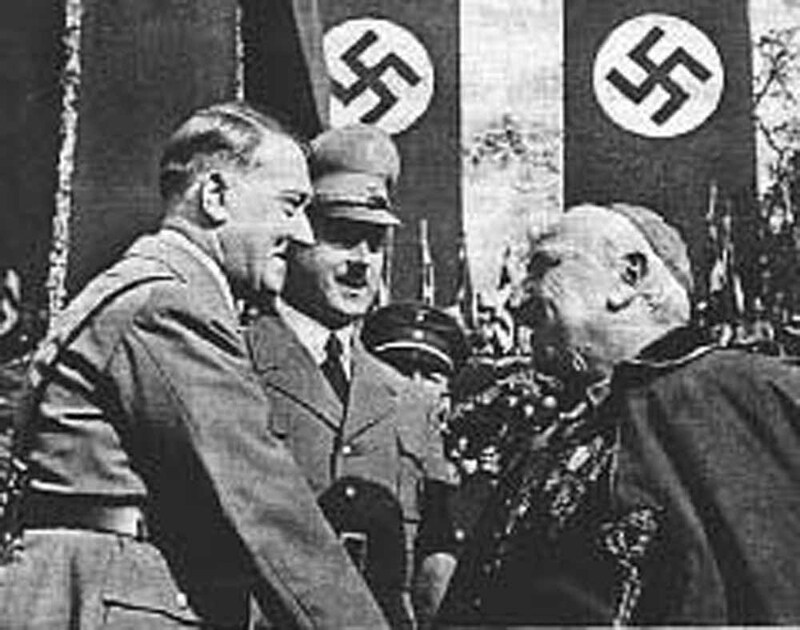 There were certainly Catholics who believed that Nazi ideology was contrary to and incompatible with their Catholicism, but there were also plenty who just as sincerely believed that Nazi ideology was compatible with their Catholicism. I’m not arguing that the latter were more right than the former, but rather that the latter were just as sincere as the former and could offer serious theological and historical arguments to back their case. (2) like the church, “National Socialism is the declared opponent of the atheist movement and also of the lack of ethics in society.” Building on this healthy formation, the church can address “the great task of the present age: the creation of a new ‘Catholic human being’ who will replace the Sunday Catholic.” As Lortz saw it, this kind of cooperation between church and state occurred in Italy, where Pius XI and Mussolini initiated in 1931 collaboration between the Catholic youth organization and the state. (3) National Socialism and Catholicism affirm “the natural order of creation.” National Socialism is intent upon leading Germans back to their cultural and ethnic origins so that they may once again flourish as a people. Since Catholicism believes in the complementarity of nature and grace, it can endorse Nazi efforts in this regard and simultaneously build on this foundation while it focuses on the spiritual realm. (4) National Socialism and Catholicism hold that a society is not merely an association of individuals but rather a social unity in which individuals participate. Pius XI himself called for a corporatist society in his encyclical Quadragesimo Anno. (5) National Socialism and Catholicism aim at overcoming modernity’s “spiritless intellectualism.” Both emphasize the “spiritual life” that undergirds intellectual inquiry. Many may be surprised at attempts to draw such detailed parallels between Nazi ideology and Catholicism, but this happens in many other cultures with many different political and economic systems. Everywhere you turn, you can find people trying to argue that “true” Christianity already anticipated or is most compatible with whatever political and economic systems they happen to be living in and we need to realize that neither will be entirely fulfilled until they are blended with other. We can find such arguments with communism and capitalism, democratic and authoritarian politics, liberalism, and conservatism, and so forth. So Joseph Lortz wasn’t doing anything unusual — it’s just that he was doing it with a political and social ideology which everyone has come to realize is evil. No one who tries to blend Christianity with market capitalism or liberal politics wants to think that their project shares anything at all with what Christians like Lortz were doing, but ultimately they are all far more similar than they are different. Particularly significant here is the fact that as a professional theologian, Lortz can’t be dismissed as not being a “real” Christian — a common response from Christians when faced with stories of fellow believers whose political and social beliefs led them in a different direction. Naturally the lesson here is not limited to Catholicism alone, or even just Christianity alone. Protestants and adherents of other religions engage in very similar behavior, though in my experience it seems to happen more often in the context of Christianity than other religions. I’ve never read about anyone trying to blend capitalism with Hinduism, or democratic politics with Buddhism. The ability of Christianity to blend with a variety of cultures, politics, and social systems has been part of what has made it so successful. At the same time, though, it has led Christians to forget the degree to which contingent political ideologies, cultural traditions, and other external factors have become enmeshed with their faith. It might be wise for them to care about this and avoid actions which could serve to embed aspects of contemporary politics or economics into their religion. That’s one possible consequence of current faith-based politics which seeks to encourage greater political activism that is motivated by religious belief. Previous Post Are You an Agnotologist?